Meal planning without time, energy, or take-out is always a dilemma for the frugal mom. I'm trying to plan several meals for after the baby. I even went on a Walmart mission with surplus grocery money in hand, determined to buy some of those convenience foods I avoid like the plague. Call it a preemptive strike against the junk food my mom will surely pack into my cupboards. (Laffy Taffy, chocolate milk and spaghettios, anyone?) If my son has to eat something out of a flip-top can, it can be a healthier alternative chosen by me (diced fruit in its own juice versus heavy syrup, for instance). I was shocked at the cost and limited selection, though! I came home with a renewed motivation. Sue Gregg's Meals in Minutes cookbook has menus of five entrees designed to be cooked and frozen in a single session. The casseroles are higher carb than what I would normally cook, but still healthier than what my husband, alone, would order at a restaurant. I bought two boxes of quick-cook brown rice for convenience. Our small family can split each entree into two loaf-size pans, making 10 meals for the five recipes. Perishable wish list--using my Aldi receipt, I jotted down several fresh foods which would be nice for my mom to bring during the weeks after birth (she drives past Aldi every day). These include yogurt, milk, apples, bananas, bagged spinach, broccoli, etc. Hopefully this will divert her from a daily stop by the gas station! The giant pot 'o soup for myself. I don't want to recover on a diet of crackers and Campbell's like I did last time. For the next several weeks, I plan to make a giant crock of vegetable beef soup each week. I can scoop a cup from the refrigerator for meals and snacks if needed. In fact, I'm eating a bowl right now! I won't bother freezing ahead because I like the crunch of fresh vegetables. Can you guess what I'm using for the tomato base? My stockpile of organic Ragu! 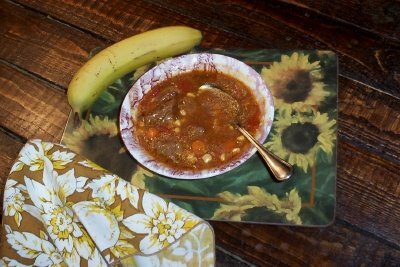 Mmm....can you share your vegetable beef soup recipe? Will any of the ladies at your church bring meals? We do alot of that here. Ditto on wanting to know your soup recipe. Yes, I would also like to have your soup recipe! The picture of it looks scrumptious! Unfortunately no recipe! I had half a jar of Ragu that needed to be used, so I poured that in and added another jar and a half of water. I had 1/2 a pound of reduced-for-quick-sale natural stew beef to throw in. I chopped two small Vidalia onions, a few handfuls of baby carrots, and the kernels from two ears of raw corn. Seasoned with salt, pepper and a bay leaf. Simmered all day in the crockpot. In the summer I hope to make gazpacho, something else I--and only I, in this family--will eat for days on end. I try to keep some meals in the freezer for those times I don't want to cook. Homemade chicken noodle soup, along with many chilis, freeze really well and it's easy to pair with a cheese sandwich or something. I also send it with my husband for lunch sometimes when I'm running late and don't have anything made for lunch for him yet. I usually get some of the two+ cup sized Gladware style containers from the Dollar Tree for using in the freezer and they last through several washings and reusings. One thing I suggest to new moms a lot is muffins. You can add a lot of nutrition to a muffin, have a large variety, and they are quick to make and easy to freeze. Plus, kids like them, too. A good healthy muffin can be eaten with even a glass of milk or juice and be a decent mini-meal. Add some carrot sticks, and smear with peanut or almond butter and they can make a whole meal. Meredith, have you tried "fruit soup"? it's not hot, basically cantaloupe and some mint, lemon, other stuff blended, served cold with dollop of whipped or sour cream and fresh fruit in season chopped on top (blueberry is great). Your gazpacho made me think of it. Probably doesnt freeze well, though!